The SIMS process is initiated by bombarding the surface of a solid sample with an energetic beam of ions (1-50 keV). This primary ion beam bombardment results in the ejection of atoms and molecular fragments from the surface region. Only a small percentage of the emitted fragments are positive or negative ions. It is these secondary ions that are mass analyzed in SIMS. In static mode of ToF SIMS, the primary ion beam is maintained at a very low fluence (typically less than 10^12 ions/cm^2) so that secondary ions are not emitted from an area damaged previously by another primary ion, resulting in the emission of molecular fragments from organic and biological materials. The structure and composition of these fragments is directly related to the molecular structure of the surface they were emitted from. Thus, analysis of the type and amounts of secondary ions emitted from a sample under static SIMS conditions provides information about the molecular surface structure of organic and biological materials. 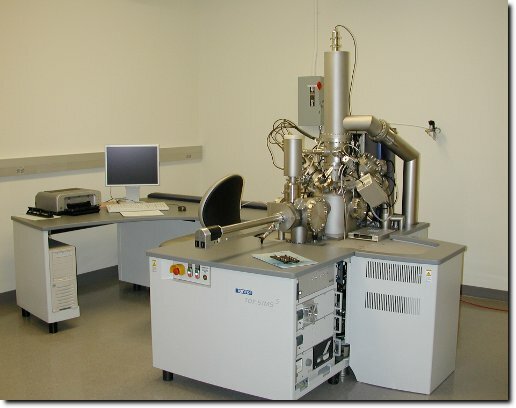 When used in conjunction with other surface sensitive techniques such as electron spectroscopy for chemical analysis (ESCA), a detailed understanding of surface structure and composition can be obtained. A key feature of modern, state-of-the-art SIMS systems is the ToF analyzer used to detect the secondary ions. The ions are extracted from the sample and accelerated into the field-free analyzer with a common energy (but different velocities). The difference in velocities means the smaller ions move through the analyzer more rapidly than the larger ions, providing mass separation of the ions. When the secondary ions strike the detector their masses are determined from the time it took them to travel through the analyzer. Overall, the combination of the ToF analyzer with the static SIMS process results in a powerful surface analysis technique. The features of this technique for organic and biological materials are highlighted below. Theoretically, the mass range of the ToF analyzer is unlimited. Furthermore, the low fluence of the primary ion beam favors the emission of intact molecular ions and high molecular weight fragment ions. In practice however, typically only ions with masses below 2,000 Daltons are observed, probably due to intermolecular interaction of atoms in the sample that inhibit the ejection of large, intact molecules. Ions with masses as high as 10,000 D can be generated and analyzed by optimizing sample preparation conditions (e.g., physisorbed molecules deposited at low concentrations on a surface). The deposition of the sample as a monolayer on a metal substrate promotes the desorption of large ions and increases their stability through metal cationization. In this manner, synthetic polymers can be characterized, allowing evaluation of the molecular weight distribution of intact oligomer chains. In addition to molecular ions, large and small fragment ions are generated by the ToF SIMS technique. These fragment ions are valuable for structural analysis of the material. For example, fragment signals corresponding to amino acids can be identified in the analysis of protein molecules. The ToF analyzer is capable of high sensitivities, with detection limits in the part per billion range, due to its high transmission and parallel detection of all masses. In comparison, traditional analyzers (sector, quadrupole) have much lower transmissions and lose valuable information since these mass analyzers must be scanned to detect ions with different molecular weights. The high sensitivity of ToF SIMS is important for the characterization of self-assembled monolayers and Langmuir-Blodgett films, as well as for trace analysis in organic films. Another feature of the ToF analyzer is the high mass resolution performance, often over 10,000 (m/Δm). The high resolution permits positive assignment of peaks in complex systems through the ability to distinguish species whose masses only differ by a few millimass units. For example, identification of glutamic acid and lysine amino acids (both producing fragments with a nominal m/z of 84) in an adsorbed protein film is possible with ToF SIMS. Furthermore, in the high mass range (several thousand Daltons), high mass resolution spectra obtained for intact polymer chains cationized from silver substrates can be used to examine the isotopic distributions of C, H, and Ag atoms in the emitted ions. The sampling depth of static SIMS is in the range of 10 to 20 Å, since only the particles in the outermost region of a sample have sufficient energy to overcome the surface binding energy and leave the sample. The sampling depth of ESCA, in comparison, is significantly larger (typically in the range of 20 to 100 Å, depending on the sample and analysis conditions). The two techniques are often used in combination to gain a more detailed understanding of the surface composition of the material and how it varies with depth into sample. One research project at NESAC/BIO uses the surface sensitivity of static SIMS to study adsorbed protein molecules. Many proteins of interest have dimensions between 40-100 Å, which is larger than the static SIMS sampling depth. Therefore, the shape and position of the protein relative to the volume sampled by the static SIMS technique is expected to have a direct effect on the ions generated. For example, the ratio of hydrophobic amino acid signals to hydrophilic amino acid signals detected in the static SIMS experiment is expected to provide insight into the unfolding of adsorbed protein molecules. With ToF SIMS, a two-dimensional chemical map of the surface can be generated. A highly focused primary ion beam (ca. one micron in diameter) with high brightness is rastered across the surface of the sample, and the secondary ions are collected at specific points. The high lateral resolution is advantageous for characterizing the distribution and location of large organic molecules on metal surfaces. The technique has also been useful for the imaging of patterned organic films and the surface composition of fibers.